Everybody knows about the famous tours in the southern part of Peru heading from the coast towards Cusco, but what about exploring some of the lesser-known places in Northern Peru that offer many wonderful attractions of their own. This Northern Peru Itinerary is recommended for anyone planning to visit Peru with limited time but wanting to experience new alternative touristic routes. Don’t miss this journey through the major sights of Northern Peru! Lima: This is the standard starting point when arriving in Peru. The Peruvian capital definitely deserves a couple of days to see. Take some time to visit the bars and clubs as well as Peru’s best museums, theaters and art galleries. If you’re looking for fun, drinks and parties, visit Barranco or check out the popular Malecón (boardwalk) of Miraflores for an amazing view of the Atlantic Ocean. Don’t miss the Plaza de Armas, full of historical buildings. Once you’re ready, sort out your bus ticket towards Trujillo which should cost around s/70. Trujillo: The next stop will be Trujillo, located around 8 hours from Lima by bus. Trujillo is known as “Ciudad de la Eterna Primavera” (City of Eternal Spring). Enjoy sunny days at Huanchaco beach, do some surfing, try the local ceviche or take a ride on the famous Caballitos de Totora (one-person boats made of reed grass which locals have used to ride the waves for centuries). Visit the massive ancient ruins of Chan Chan as well as the Huacas del Sol y la Luna. Once you’ve seen everything, buy your onward bus ticket and get ready to head to Chiclayo. Chiclayo: Well-known for its delicious food, don’t miss the opportunity to sample some of the traditional northern cuisine like Arroz con Pato (rice with duck), Seco de Cabrito (local dish made of goat and rice) and ceviche made with freshly caught local fish. If you’re on the hunt for an amazing day at the beach, Pimentel Beach is the perfect place for you. Spend the day lying on the sand and swimming on soft waves. Chiclayo is also home to some of the country’s most important archaeological sites, including the tomb of The Lord of Sipán, which has been compared to King Tutankhamun’s in Egypt. After you’ve seen everything in Chiclayo, it’s time to head to the highlands in Cajamarca. Cajamarca: One of the most important cities in Northern Peru, Cajamarca is an excellent destination that you should not miss. Although Cajamarca does attract many tourists throughout the year, the most popular time of the year to visit is during February for the city’s Carnaval festival. 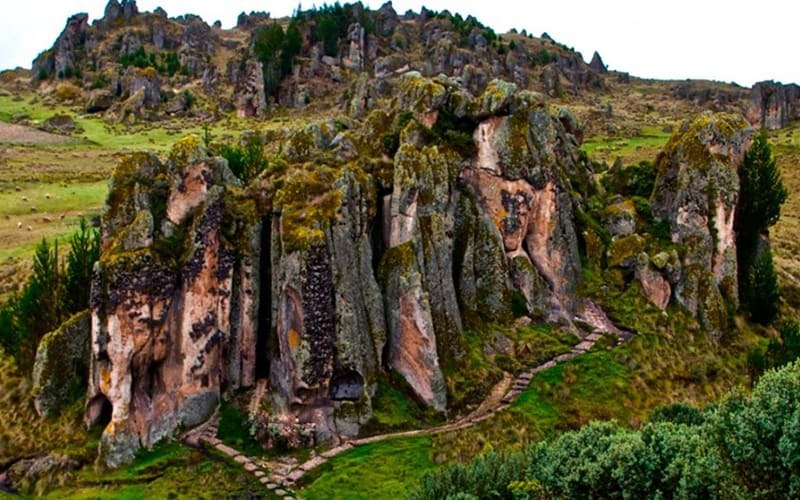 Attractions to see in Cajamarca include: The 6 Churches of Cajamarca, The Cumbemayo Stone Forest, Hot Springs in Baños del Inca, Ventanillas de Otuzco and Cuarto de Rescate (Ransom Room). Don’t forget to bring warm clothes as the weather can be very cold. The next stop will be the cloud forests of Chachapoyas. Chachapoyas: Named after a famous pre-Columbian civilization, Chachapoyas is a nice historic town with wooden balconies, colonial style and safe streets. You will definitely enjoy its relaxed lifestyle, beautiful blue skies and lovely people. 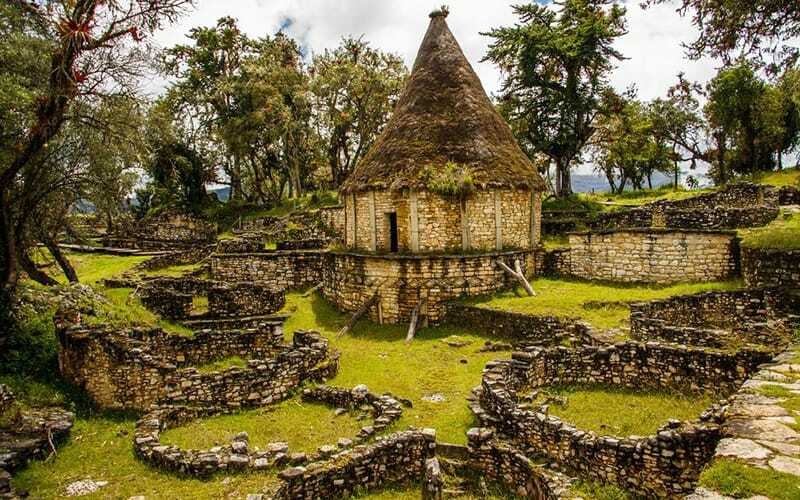 Make sure to visit Kuelap, a famous citadel of the Chachapoya people (often called the “Macchu Picchu of the North”). The Waterfall of Gocta, the Sarcophagi of Karajia and the Museum of Leymebamba are also must-see places. Finally, make sure to try the delicious artisanal bread and varieties of cheeses from this area. (click our guide to the Amazon region for more info). From Chachapoyas, you will begin to descend into the jungle and head to Moyobamba. Moyobamba: Heading into the selva alta, or high jungle, takes around 8 hours from Chachapoyas. You’ll arrive first in Moyobamba, known as the City of Orchids due to the wide variety of these flowers found there (see our guide to the San Martín region for more info). This jungle city deserves at least a couple of days, and it’s the perfect place to experience adventure, nature and culture all in one place. Make sure to visit Aguas Termales de San Mateo (Hot Springs of San Mateo), natural pools with therapeutic properties. You can also go on jungle hikes to the Morro de Calzada or to visit numerous waterfalls. No list of things to do in Moyobamba would be complete without including the local food. Try the famous Avispa Juane (traditional jungle dish made of rice, ground beef, eggs and chicken) or Inchicapy (green chicken soup with peanuts, cilantro and yuca). Next, you can head further into the jungle to the city of Tarapoto. Tarapoto: Just 2 hours from Moyobamba, Tarapoto is one of the most popular destinations in Northern Peru. Well-known for its nightlife, year-round good weather and amazing attractions, you’ll fall in love with Tarapoto from the moment you step foot there. Visit Calle de las Piedras (Stones street) to have some fun and try exotic drinks or food. If you’re on the hunt for adventure sports, Ahuashiyacu Waterfalls is the perfect place for you. Laguna Sauce is your bucket list item to check off during your visit to Tarapoto. This huge blue lagoon has small boats available to rent and even tours available, so make sure to spend a full day in this hidden place. 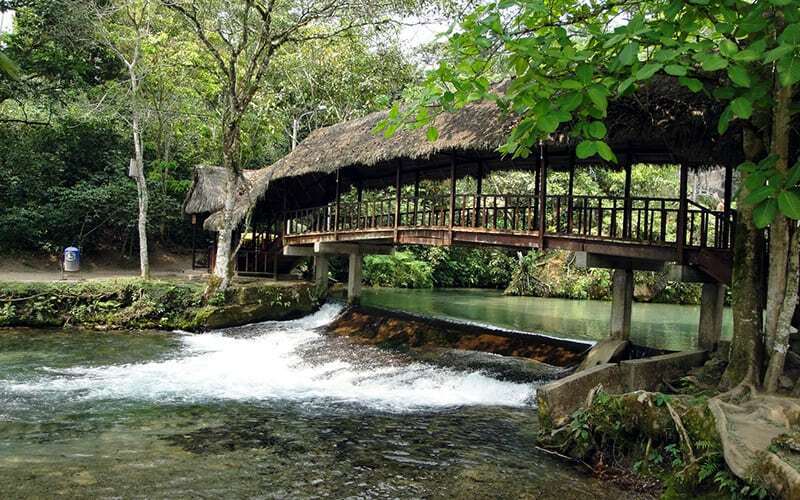 It’s recommended to spend at least two days in Tarapoto since there are many different places to visit. Next it’s time to head to the selva baja or lowland jungle in Iquitos. Iquitos: This is one of the most famous places in Peru. The traditional way to reach the city of Iquitos is by air in just one hour. Alternatively, you can reach Iquitos by boat, sailing down the Amazon River and its major tributaries. To get to Iquitos by boat, you’ll need to get to the town of Yurimaguas which is accessible from Tarapoto by ground transport. From Yurimaguas, you’ll travel on the Marañon River before finally reaching the city of Iquitos. Here you’ll be able to experience some of the most amazing jungle scenery and wildlife in Peru, including butterflies, bats, jaguars, pink river dolphins, caimans and monkeys. There are a number of excellent protected natural areas in the vicinity, including the pristine Pacaya-Samiria National Reserve. Ethno-tourists will relish in the chance to visit the indigenous settlement of Yaguas, a short boat ride from the town. If you’re seeking spiritual guidance, don’t miss the opportunity to try Ayahuasca. The places mentioned above represent some of the best attractions in Northern Peru, with a large variety of different things to see and do. You will experience beautiful coastal beaches, misty cloud forest, beautiful waterfalls of the high jungle, and the steamy lowland jungle all in one amazing trip. If you’re planning to do the complete tour, then three weeks is just about enough time to do it, as each city deserves at least two days to see the most important sights. On the other hand, if you choose to skip a couple destinations or travel by air rather than bus, you can manage to see a lot of things in a week as well. This Northern Peru itinerary is becoming more and more popular for good reason as the cities are amazing tourist destinations, the route is easy to navigate and the tourist infrastructure is good. Keep in mind that as the tour goes ahead, you’ll experience he different kinds of Peruvian climate from frigid highlands to sweltering jungle, so make sure to bring all the necessary appropriate clothing for the different types of weather. Follow this Northern Peru Itinerary to see some of the amazing sights of Northern Peru, from the coast to the highlands and jungle. You will soon discover for yourself why this alternative touristic route in Peru is getting more and more popular. What are you waiting for? Start planning your perfect dream trip to Northern Peru today!